Virtual Planets Atlas Version 2 (VPA Pro 2.0) is the second release since the software’s introduction in 2013. The tool allows users to study topographic and scientific data for planets and satellites surfaces. 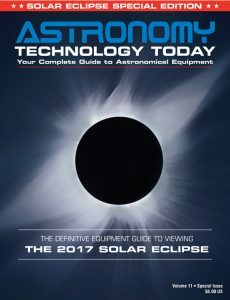 It is published by Christian Legrand, a lunar observer, and co-author of the guide “Discover the Moon” by Cambridge University Press and Patrick Chevalley, author of the planetarium software Cartes du Ciel. The duo is the same team who publishes the Virtual Moon Atlas software which offers a database with more than 60 000 entries of topographic and scientific data of the Moon’s near side and far side. The Virtual Planets Atlas offers data as it becomes available for telluric planets and Solar System satellites. The data is made available from the fleet of performing probes sent by the various space agencies (USA, Europe and others). The release of version 1 included Mercury, Venus and Mars. New for Version 2 is the addition of Jupiter and its four Galilean satellites. 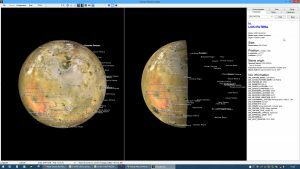 With VPA Pro 2.0, the authors have integrated the latest data available from the International Astronomical Union (IAU) for Mercury, Venus, Mars, Io, Europa, Ganymede and Callisto. For Jupiter, they created a special database that includes all the available information about zones and belts. Additionally, there are now 401 named formations for Mercury; 2033 named formations for Venus; 1797 named formations for Mars; 227 named formations for Io; 112 named formations for Europa; 190 named formations for Ganymede and 154 named formations for Callisto. VPA Pro 2.0 is available as a free download for Windows, Linux and MacOs at http://www.ap-i.net/avp/en/start .